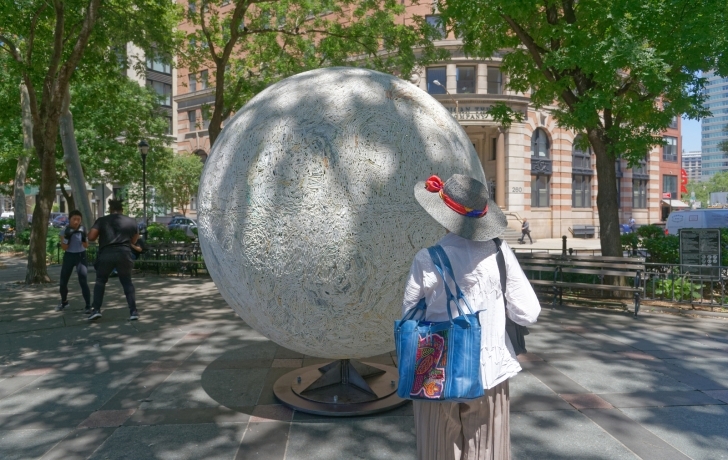 “It was love at first sight with this park,” said artist Rebecca Manson, standing next to her eight-foot-tall spherical sculpture, the new temporary centerpiece for Tribeca Park at West Broadway and Beach Street in Tribeca. The work had just been installed Monday morning and Manson was watching the first curious viewers as they passed through the park, or got up from a bench for a better look. The work, titled Come Close and the View Gets Wider, is composed of thousands of ceramic bone-like pieces. (“I want to know how many so bad!” the artist said.) The sculpture invites viewers, once seeing it from a distance as a big textured globe, to look closer at the many tiny parts that make up the whole. The piece, conceived four years ago, took a year to come together and for six weeks alone, Manson said, she was tearing off bits of clay and would “roll, smush, smush” them into the bone-like parts, to be fired and glazed and stored in piles, then organized by shape and color. Manson started with a four-foot-diameter model of the work, then figured out how to structurally scale it up so that it could be strong enough to be supported. She composed the pieces on a fiberglass dome that served as a mold. Removed from the mold, the two sculptural hemispheres were joined together on a specially fabricated aluminum structure. Come Close and the View Gets Wider, part of the Parks Department’s Art in the Parks program, will be on view in Tribeca Park for one year.